The carrots in this house are staging an uprising. They feel they never get to be the star of the show. I guess they do have a point (as evidenced by the roasted radish and carrot dish and vegetable dip). So we are giving into their demands for the royal treatment….their very own dip! 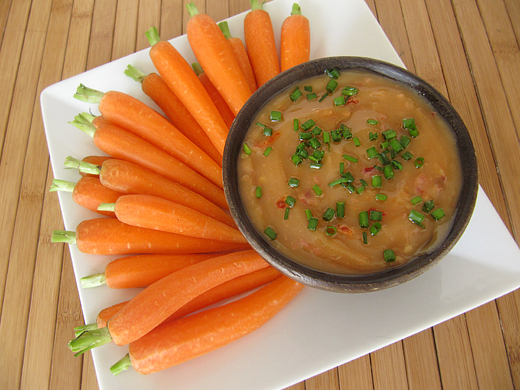 We love how the sweetness of the carrots works with the creamy nuttiness of this tahini dip. My tahini was pretty separated, with the liquid on top and the paste on the bottom. I stirred it up as much as I could, but it was still mildly runny, which was actually a good thing, as it made combining the ingredients easier. After mixing the tahini, add the tahini, soy sauce, sesame oil, canola oil, honey, rice vinegar, sambal oelek, and lemon juice into a medium-sized mixing bowl. Stir all the ingredients together. If your dip is too thick, try adding some a little canola oil to thin it out. Place in serving bowl, and add chopped chives on top for garnish. Serve with the peeled baby carrots. I am not familiar with sambal oelek... I will have to google it, but the rest of the ingredients in the dip sound delicious. Sambal (or Sambal Oelek) is our new favorite hot sauce. It seems to work with anything, and has a great taste. It looks like a jar of garlic chili paste, but it isn't so garlic heavy, and our everyday supermarkets seem to carry it now. I know I would have to conduct a big search to find some of these ingredients but it would be worth it. This is very creative, this is the first dip I have seen using tahini. Your pictures have such vibrantly colored carrots, I would like some to dip now! Yea, it may depend on where you are. In Orange County, I think they sell all this stuff at Ralphs (everyday supermarket). love the happy vibrant carrots with that spicy tahini dip! I've never made a dip with carrots, but this is a good veggie dip. Time to try it. Thanks for stopping by my blog, and your kind words. So unique and so delicious sounding! This is the second carrot recipe I've seen tonight - it's a sign! Those are some bright, beautiful looking carrots. I've never made tahini (only hummus!) thanks for the cool recipe! Your spicy tahini dip sounds too good! I'm super boring with tahini, I've only used it in hummus, I need to give this a try! This sounds SO good! If I can just find some of these more unique ingredients here in the middle of nowhere I'm good! LOL! Carrots are a mainstay in this house, and this would be a great way to use some up! Thanks so much for sharing! I have so many carrots at the moment so this sounds like a brilliant idea! I can imagine it works really well with the tahini. I better not let my carrots talk to your carrots or they really might revolve! This dip reminds me of a soup I made recently...so delicious! This dip looks yummy! Interesting combination! We eat a ton of dips every week (slight exaggeration) but I've never made a carrot one. I'm going to try yours. Yea, dips are pretty amazing. This one is really just for dipping carrots into, not using carrot in the dip. Tahini Dip would've probably been a more accurate title.